A peculiar thing happened on the way to the present day from Pentecost: the Church suddenly stopped calling the Jews to conversion. Sure, if we are being honest, we must admit that the Church is now reticent to explicitly call anyone who dwells beyond the fold into the one true religion, but in the decades since Vatican II, the Jewish people have evidently become the “untouchables” in the minds of many churchmen. On Pentecost, St. Peter called his Jewish brethren to conversion saying, “Do penance: and be baptized every one of you in the name of Jesus Christ, for the remission of your sins. And you shall receive the gift of the Holy Ghost. For the promise is to you and to your children and to all that are far off, whomsoever the Lord our God shall call… and there were added in that day about three thousand souls” (Acts 2:38-39, 41). And what of the present day? In reaction to news that the Superior General of the Society of St. Pius X (SSPX), Bishop Bernard Fellay, had referred to the Jews (along with Masons and modernists) as being among those “enemies of the Church” who vehemently oppose the Society’s canonical regularization, Father Federico Lombardi expressed shock. He issued a statement saying that the Church is committed to “dialogue and deepening relations” with the Jewish people, an approach that he said is reflective of the Vatican II document, Nostra Aetate, as well as the statements and initiatives of the Holy See in the decades since. Where once the Apostles risked death in order to evangelize the Jews, their successors often seem content to take shelter in the safe harbor of polite conversation. The contrast is so startling that if the Holy See’s public relations apparatus had been present at the time of Pentecost, one can well imagine it would have distanced itself from St. Peter with a speedy apology! The SSPX has since issued a statement of its own clarifying that Bishop Fellay’s comment was aimed at the “leaders of Jewish organizations” and not the Jewish people, either individually or at large. “The word ‘enemies’ used here by Bishop Fellay is, of course, a religious concept and refers to any group or religious sect which opposes the mission of the Catholic Church and her efforts to fulfil it: the salvation of souls,” the statement said. One might immediately think of Sacred Scripture wherein we are told, “No man spoke openly of Jesus, for fear of the Jews” (cf John 7:13), and yet we simply accept that this does not mean to say that every individual Jew was to be feared; rather, it clearly refers to that well-organized group of which it is written, “the Jews consulted together to kill Paul” (cf Acts 9:23). The Council’s treatment of the Jews in Nostra Aetate, regardless of its merit with respect to the Church’s mission, also deals in religious concepts. The document primarily concerns itself with what one might call an “inter-religious” relationship that is animated by the shared spiritual patrimonies of our respective faith traditions. 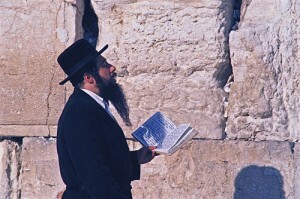 It must be said, however, that many of the most vocal so-called “Jewish leaders” of our day are not to be confused with men of religion; rather, they deal primarily in the stock and trade of political activism, conveniently hiding behind the Mogen David even as they worship at the altar of humanism. Consider, for example, Abraham Foxman of the ADL, one of the vociferous opponents of the Society’s regularization to whom Bishop Fellay was presumably referring. In the last several years alone, Foxman and his organization has launched an all-out offensive against Summorum Pontificum (Pope Benedict XVI’s motu proprio on the Traditional Latin Mass), the canonization cause of Venerable Pope Pius XII, and the Holy See’s doctrinal discussions with the SSPX, all in an obvious attempt to turn the Church’s internal affairs into a series of PR initiatives and fundraising gimmicks. Men such as these are not, and never have been, a party to the inter-religious relationship of which Nostra Aetate speaks. Any group, Jewish or otherwise, that seeks to hamstring the work of the Church, promoting such evils as abortion and homosexuality, even going so far as to oppose the celebration of Holy Mass according to ancient usage, is clearly an enemy of the Catholic Church, and by extension, her divine Founder. Of this there can be no dispute. The degree to which certain individuals are invested in opposing the Lord and His Church – relative to full knowledge, invincible ignorance, or something in between – is a matter for the Just Judge to decide, but we mustn’t forget that Our Lord had something to say about how we are to treat our enemies. This brings me back to the sea change in the Church’s approach to the Jews in recent decades. “Love your enemies: do good to them that hate you: and pray for them that persecute and calumniate you,” says the Lord (Matthew 5:44). Tell me, who does more good, those who behave as though the Jewish people have no need of conversion simply because they call upon God as “Avinu, Malkeinu!” (Our Father, Our King), or those who will endure every persecution while emulating St. Peter in approaching his kinsman, making known the duty incumbent upon them to worship Jesus Christ, their long-awaited Messiah? Who has more love, those who speak as though the people who reject the Sovereignty of Our Lord are as yet in God’s will, or those who persevere in making it known that rejecting Christ the King is tantamount to despising “He who sent Him?” (cf Luke 10:16). We often hear that Vatican II was intended to bring about a “New Pentecost.” Fifty years hence, we desperately need one. I’ll believe that day is dawning when our churchmen once again call upon those “of whom is Christ, according to the flesh” (Romans 9:5) to repent and to come to the waters of baptism, exhorting them, saying, “Save yourselves from this perverse generation” (Acts 2:40).